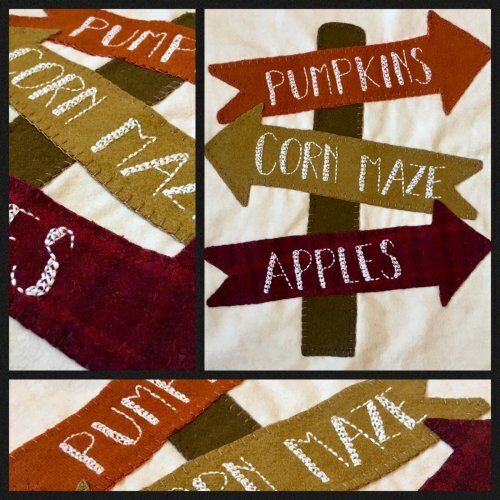 We are so excited to share with you the NEW Mystery Block of the Month designed by Sew Blessed....Welcome to the Pumpkin Patch! Check out the details below! This 12 month program is wool applique on flannel. The first block in a 12 month series. Finished size for block one is 12 1/2" x 12 1/2". Kit includes background fabric for the first 9 blocks and wool for block 1. Thread kits will be available soon! Pattern can be downloaded through our website or a printed copy may be purchased from the shop! BOM price will be $14 monthly OR $16 monthly with a printed pattern. We hope you all have a great day!